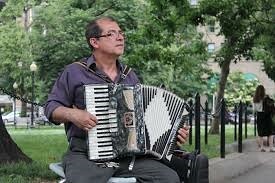 Juventino Villeda plays his accordion. Photo by Barbara Corbellini Duarte. The magic of the MagicJack was not in how much money it saved me, but in how it connected me to another human being. I put the phone equipment for sale on Craigslist, with an asking price a fraction of the original cost, just to be rid of this unused thing, to get something for it. After a few days, I received an inquiry from a man named Juventino. We emailed back and forth, and finally met at a local thrift store on a bitterly cold morning. Juventino was more than an hour later than he had initially indicated he would be. I had gone grocery shopping, looked around the thrift store, and had begun to feel some annoyance at his lateness, but decided I would rather cultivate patience, because I could not know what was the delay, and because it is more important to stay calm than to carry on. With the aid of our cell phones, my customer and I met at the front of the thrift store. Juven asked me if I speak Spanish. “Un poquito,” I said, “a little,” and he smiled. “E muy mal,” I added, “and very badly,” which gave the man a laugh. He explained that he reads English well, but hearing and speaking it are more difficult. I told him that I understand, as it is the same for me with Spanish. We braved the wind and cold, hurrying to my car, making our exchange in the parking lot. Juven handed me $1 bills, explaining that, “I pay with singles because I play the accordion.” As the sharp wind cut into our faces and hands, the man went on to tell how he had started playing the accordion at age five, and began as a street musician at about 5-1/2 years-old. He confessed to having told his mother that he needed to take the instrument to school, in order to practice for a Mother’s Day concert. However, that day he skipped school and went instead to a festival at the Catholic church, playing his accordion and accepting donations from passers-by. Juventino informed me that he used that money to buy his second accordion, though he gave the coins to his young friends, as well as purchasing ice cream for “too many” other children, he said. The 65-year-old’s enthusiasm for his music was clear, as was his kindness. He asked me why I had not used the MagicJack, I said that I had not figured out how to use it with my computer, and he offered to come over and help me. I told him that the computer was on its way out, but that I appreciated his offer. The extreme cold and wind bit us repeatedly as we stood in the parking lot after making our exchange. Juven told me to email him and then he would send some MP3 files of his music. I thanked him for his kindness, told him I would email him, and went home. I wished him well and hoped that his new MagicJack would serve him well. I found that through the day, I kept smiling in gratitude for having met such a nice, unusual, and interesting person. It was a morning well spent. This entry was posted in Community and tagged Fun & Magic, Giving & Receiving, Kindness. Bookmark the permalink.